A series of immense rocks rising up out of the deep blue sea. The Pontine islands are an archipelago of volcanic origin lying off the west coast of Italy, in the middle of the Tyrrhenian sea. In the province of Latina, opposite the Gulf of Gaeta, the islands are comprised of two groups: around Ponza, the largest, lie Palmarola, Zannone and Gavi; whilst at roughly 20 miles away there is Ventotene and, close by, Santo Stefano. 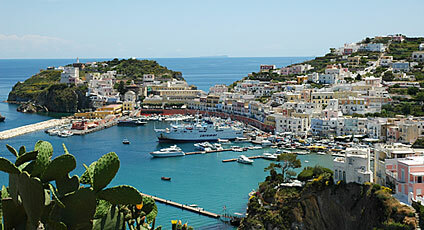 Only two of the islands are inhabited throughout the year: those of Ponza and Ventotene. 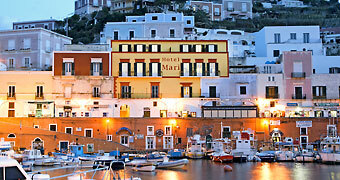 Visitors to the town of Ponza are greeted in the attractive harbour with it's backdrop of pretty pink houses clinging to the hillside. Small buses, custom built to fit along the narrow lanes, transport tourists to enchanting bays such as that of Chiaia di Luna. 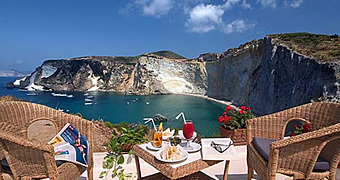 From Ponza, boats cross the waters to the dramatically beautiful island of Palmarola, now a protected Nature Reserve. With its picturesque borgo and fabulous seabed, Ventotene is a charming holiday destination and an affirmed favourite with scuba divers. 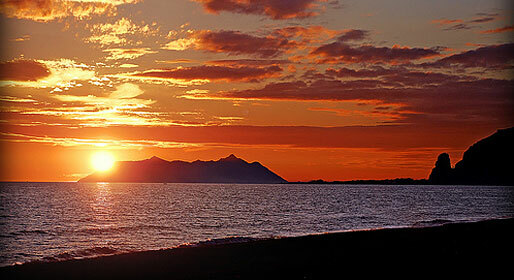 In addition to the island's many natural wonders, Ventotene conserves a number of traces of its ancient Roman past. The two largest islands are linked to the mainland by a frequent ferry service. A famous island establishment, renowned for its excellent fresh fish.